On a Sunday afternoon when I was in first grade, my father placed in my arms a Cirneco puppy and said, “ He is yours.” My first instinct was to kiss him, he was so sweet, and as I moved my cheek to his, he grabbed hold of my nose and bit me! He was never really “my” dog. I was simply my father’s excuse to bring another hunting companion into our household but he served as the beginning of my passion for the breed. At 13 I met my father’s challenge – he received my middle school diploma and, in exchange, I received my very own and coveted Cirneco. Domenico Tricomi, native Sicilian, presently resides in northern Italy where he follows tradition as an avid hunter with his Cirneco partner. He is happily retired from his career and now able to devote all of his time and energy to what has been his passion for over half a century. CdECA has been blessed to have Professor Tricomi to mentor the Cirneco in America. He has been instrumental from the inception of the organization in educating and guiding our efforts to recognize and promote the conformation and function of our amazing breed. 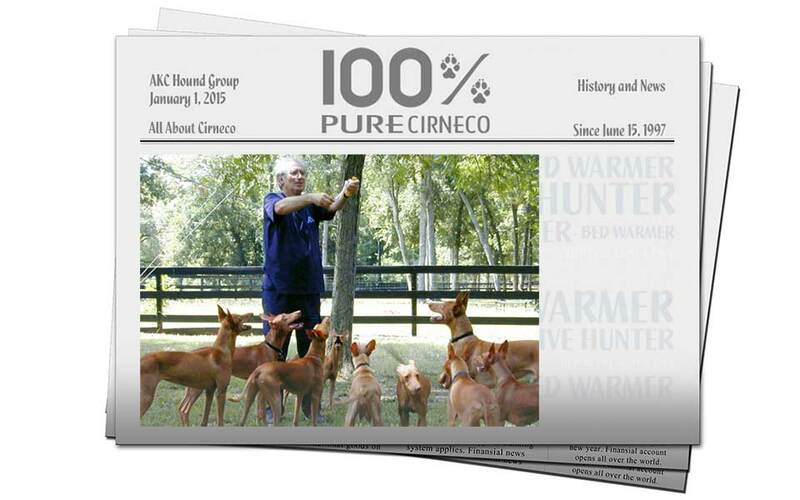 For nine years he has been present and leading our breed seminars, hunting trials and conformation ring at our Specialties as well as mentoring our East Coast Annual Hunting Trial. Thankful for the past we look forward to many more years of Professor Tricomi’s tutelage.